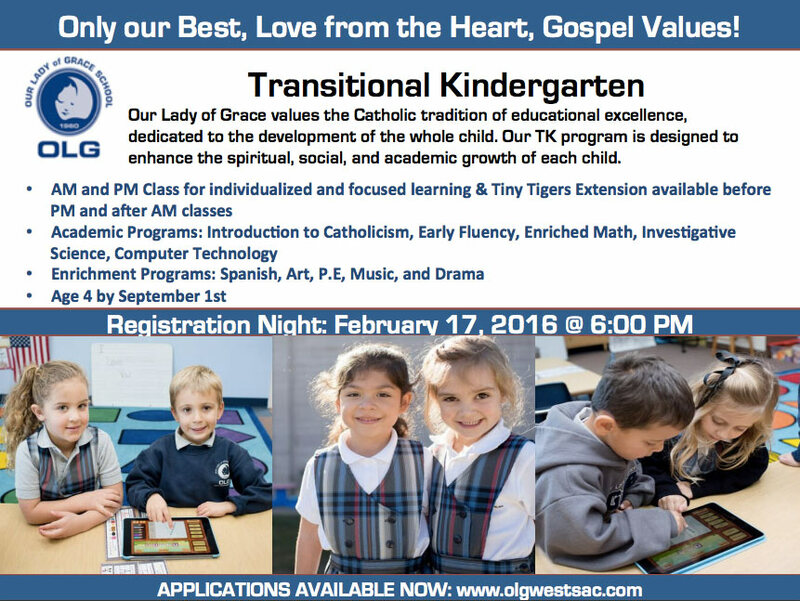 Our Lady of Grace Transitional Kindergarten values the Catholic tradition of educational excellence, dedicated to the development of the whole child. Our program is designed to enhance the spiritual, moral, psychological, physical, social, and academic growth of each child. TK represents a bridge between preschool and traditional Kindergarten. The specialized curriculum is aligned with the Common Core Kindergarten standards, but is designed explicitly to support the social, emotional, physical, and academic needs of 4 & young 5 year olds. It is designed to build self-confidence and foster social development in a loving and supportive faith based environment. The structured AM and PM class is a five day week program includes many opportunities for social-emotional development, fine- and gross-motor activities, and oral/written language development for all styles of learners. Reading, Writing, Enriched Math, Investigative Science, Computer Technology, Introduction to Catholicism, Learning about our community and the world around us. TK students participate in Spanish, Music, Art, P.E, and Creative Movement. Tiny Tigers is an Extension part of TK, which is designed to build and develop our young students socio-emotional development. Sessions may be before or after TK class. Tiny Tiger’s participate daily in arts and crafts to enhance their fine motor skills. During Imagination Station, children explore their artistic potential through music, dance and role-play. Tiny Tiger session includes snack time and quiet time.